Most of November was graced by time with family. It made me think about how those connections bind us together and enrich our lives. 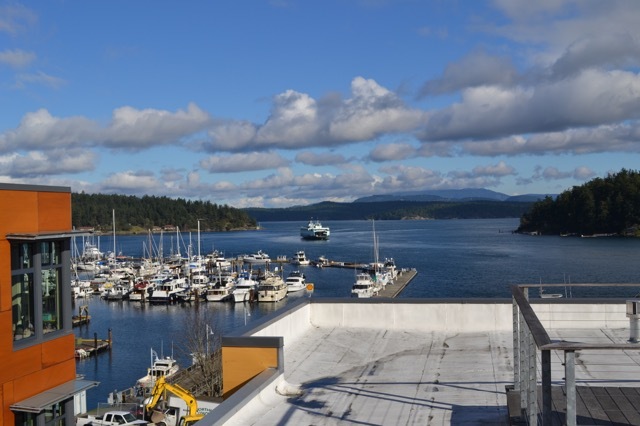 The month of November began with a special time, a trip I made with my brother to San Juan Island. We visited the sites prominent in the Pig War and spent the afternoon sitting on a rooftop watching boats glide into the harbor, bundled in our warm coats and sipping bourbon. We have been united as siblings since I was six years old, but our relationship has changed: the exuberance of youth has settled into a cozy companionship. After my brother flew away for a week, my husband and I traveled South—to California. First we visited my husband’s cousin and they talked genealogy. We had a dinner with the cousin’s wife, sister, brother-in-law, daughter, son-in-law and their two children, a sizable gathering around a large circular table in a Chinese restaurant. The participants ranged in age from our own to new baby. 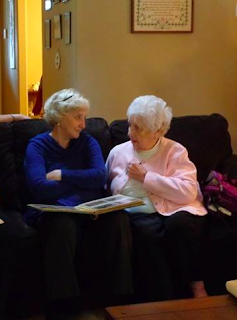 Next we visited my cousin and she and I discussed genealogy. It seems that as we age those connections become more essential to our sense of self. The following week, right before Thanksgiving, we spent eight days with my brother (who had returned from a jaunt to Las Vegas) and my two sisters. The four of us had visited each other in the interim, but it had been eight years since we had all been together at the same time. Eight days to compensate for eight years. We traveled first to Fresno for a surprise party. 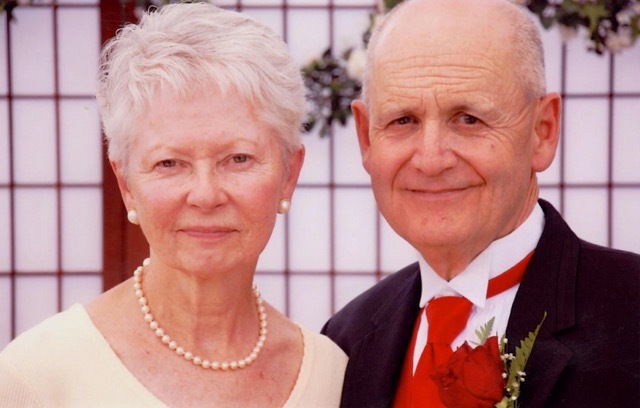 Our cousin Pam and her husband Hank were celebrating their fiftieth wedding anniversary. Hank says the marriage lasted because “I married a saint.” I suspect his sense of humor added some seasoning to that soup that is a relationship. 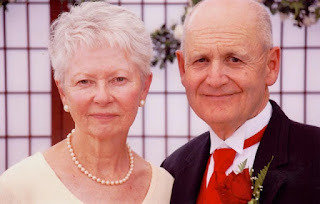 I celebrate their faith in one another, their sacrifices, their flexibility, and just downright endurance. They are an inspiration to my own marriage that is now just twenty years old. The next day we had a gathering with just family, sharing photos, stories and food.I spent time with my Aunt Barbara who is now 95-years old and whose memory is better than mine. It is impossible not to see my departed Mother’s face in hers, nor to sense the passing of family through generations. It was also a time for cousins, and it struck me how the years and time have not destroyed our connections, even though we live throughout the country and see each other rarely. I don’t think I’ve ever been told, “I love you” that many times in one weekend—and my husband uses those words freely. 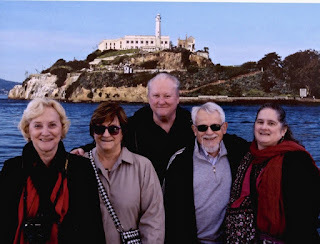 After the extended family events my brother, sisters and I (with my husband in tow) went to San Francisco. We shared three days of joking, of touring, of sharing, of hugs. We had our picture taken together, but with Alcatraz in the background, I can’t help thinking it looks a bit like we are all gathered to celebrate someone’s release from prison. Fortunately, my siblings have a wonderful sense of humor, so I can say that about these upright citizens. The extended week demonstrated family at its warmest and richest. It showed the many ways in which we are related and connected. Then we went home to Thanksgiving dinner with my son, and the woman he newly loves, the granddaughter my husband bequeathed to me when we married, and a friend of hers. As we sat round the table and gave thanks several of us mentioned “family,” the family of our youth, the family of our adulthood, the family of blood, and the family that comes together and gives meaning to the word without any of those earlier connections.